The sweetest way to send your affections, these large strawberries are harvested at the peak of ripeness and bathed in white, milk, and dark Belgian chocolates. To decorate them, we've coated each fruit with ribbons of red confection and sweet heart-shaped candies, creating treats as irresistible as they are exquisite. 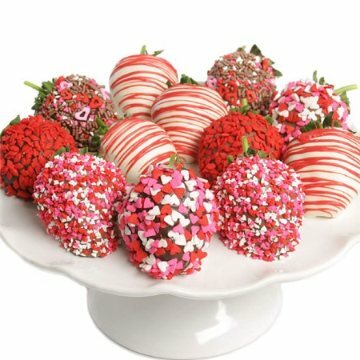 This item includes the following: Twelve chocolate covered strawberries.